Not knowing just how popular that story would be, I started out with just 25 words. To be honest, I was surprised at how easily I came up with these words – it was almost as if I was the architect-type person who spoke in this ‘members-only’ club (I am). But let’s not worry about that now, hmmm? 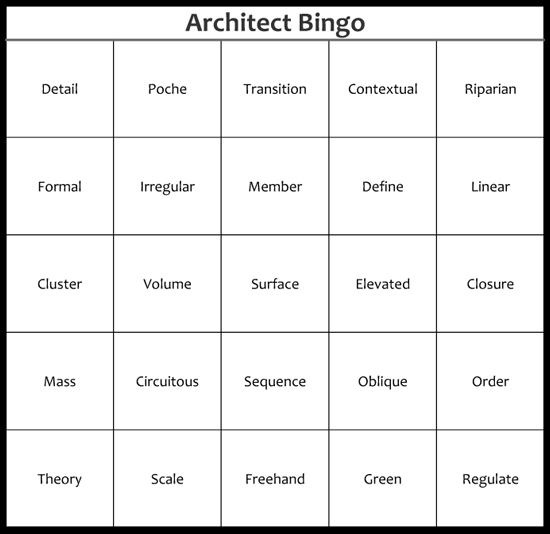 I am here today to present you with round 2 of Architect Bingo© – another group of 25 words for you to learn and incorporate into your casual daily conversations. I have expanded my list of designer-y words that you need to master. Coming out later this week are the rest of the series – cards 3 and 4 – so in the end there will be a total of 4 cards and 100 words. Once you have managed to work all these words into your daily conversations without effort, you’ll be on your way to becoming a bona-fide architect. At this point, you should expect your commissions to increase – or if you are still in architecture school that your grades will improve. You will discover that people will stop listening to you and just accept that the words coming out of your mouth are awesome and righteous … the listener will not want to expose the fact that they don’t understand the word that you are using in such a common and cavalier manner. Once you have reached this point, the real secret is that you can start making up your own words and people will be forced to believe you. This is a riff on the story ‘The Emperor’s New Clothes” and architects have been making use of this technique for decades.